Swansea City's relegation was confirmed as Peter Crouch scored the 1,000th Premier League goal of the season in Stoke City's 2-1 victory at the Liberty Stadium. 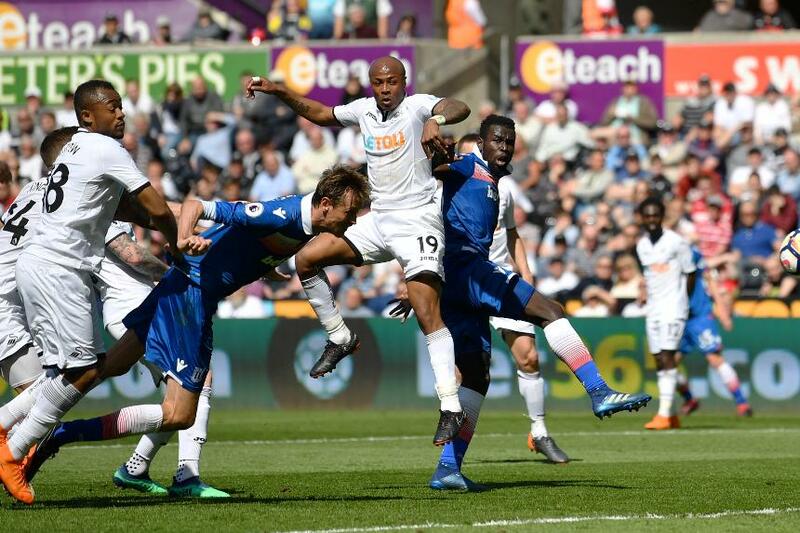 Andy King gave Swansea a 14th-minute lead as he swept in Andre Ayew's chested pass. Badou Ndiaye equalised just after the half-hour, latching on to a Xherdan Shaqiri through-ball to dink the ball over Lukasz Fabianski. Ten minutes later the visitors were ahead as Crouch headed a free-kick from Premier League debutant Lasse Sorenson into the corner. Shaqiri missed the chance to extend Stoke's advantage, as his penalty was saved by Lukasz Fabianski. Both teams are relegated from the Premier League with 33 points. Swansea, in 18th, finish one place above Stoke on goal difference.